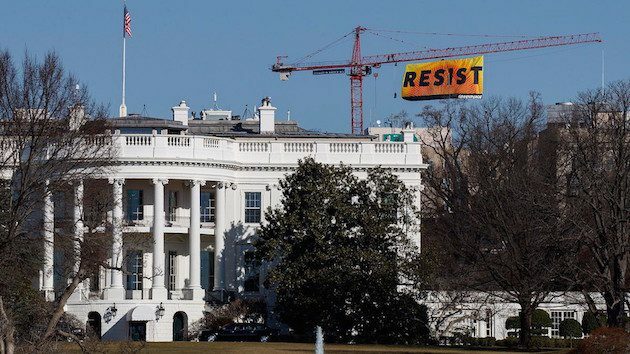 “On Wednesday morning, activists from Greenpeace unfurled a massive yellow and orange banner with the word ‘Resist’ on a tall crane behind the White House,” read the NPR story. And resistance to this anti-environmental agenda is essential if we want to keep our country, and our planet, safe for future generations. Donald Trump has put forth an anti-environmental group of advisors and cabinet nominees and this very thin-skinned president is taking no time in attacking our environment and the agencies created to protect it. On Tuesday, Donald Trump signed an executive order expediting approvals for the Keystone and Dakota Access Pipelines, overturning perhaps the two biggest environmental victories of the Obama years. He also imposed a comprehensive gag order on employees of the Environmental Protection Agency (EPA). Please take the time to read the full story by Bill McKibben at the New Yorker. Thank you for gathering this information. It’s a devastating time for birders and others who really care about our priceless and beautiful environment. Sobering moment in the History of this country. I chewed out a right wing so called birder on Facebook, this morning. I’m afraid we have lost our chances for a Birding Stamp Larry. It will be years in just getting back to that place, undoing much worse damage. Ingrid and I have contemplated that Tim. We are very concerned. Then if you join the facts above with the reality of the potential occupation of more wildlife Refuges… by armed terrorist. That’s one of the consequences of living in a presidential republic: one change of administration can turn the entire country upside down. I very much prefer living in a parliamentary republic with more stability. Sorry if that sounds a bit critical, but current political events in the US make it hard for someone from the outside to not be … er … surprised. I LOVE that video Jochen 🙂 I sent it to my Dutch co-worker and he went bonkers over it. As for having a parliamentary republic, I’m afraid that wouldn’t help here either. Our Congress, now being controlled by the Republican party, is already moving to destroy our public lands and turn them over to state control, wherein they may sell them to the highest bidder. Their latest move. Where Are You Birding This Fourth Weekend of January 2017?